If you’re looking for a classic anime and you’re a dog-lover, look no further than Ginga Nagareboshi Gin. It is one of the first and only animes to feature a dog as the protagonist of the story instead of the human. Gin, the main character, is an Akita Inu pup that proves his worth despite his size and age when he joins a pack of dogs to fight against a wild bear threatening the area and the humans within it. Eventually, he comes to lead the pack after proving his mettle to them. In 2005, the anime even earned itself a sequel, Ginga Legend Weed, about Gin’s son, a puppy named Weed, searching for his father and protecting humans in the Ou Mountains. Both are animes that dog lovers should check out if they are ever given a chance. If you want to watch this anime, however, the best way is to find subbed Japanese episodes, as the version that was released in America was censored for violent images, which led to some major key points and character deaths becoming unseen by American fans. Dog and Scissors, also known by fans as InuHasa, is a much more recent anime that also stars a dog as the protagonist… in a sense. The main character, Kazuhito Harumi, began his life not as a dog, but as a book-loving human high school student. One day, while reading at a café, a robbery occurs and Kazuhito sacrifices his life to save the life of a girl named Kirihime Natsuno. However, at the time of his death, Kazuhito hasn’t finished his favorite book series yet! This gives him a determination to live that reincarnates him not as a human, but as a dachshund dog called by the neighborhood as Kuro. He is adopted by the girl he saved, the only one able to understand him as a dog, and it turns out not only can she help him finish reading his favorite book series, but she is also a sadist who enjoys tormenting him with scissors. The anime is a comedy, and a very popular one at that. If you want a laugh, if you’re a dog lover, or if you’re a book lover, Dog and Scissors comes highly recommended by fans of anime. If you haven’t heard of the famous anime director Hayao Miyazaki or his studio, Studio Ghibli, you need to go out and begin renting movies. Princess Mononoke is one of his best, considered an anime classic by many fans. It was the highest grossing movie until Titanic came out, and was the movie that brought Hayao Miyazaki fame in the United States. The story centers around a Japanese warrior named Ashitaka, who fights and defeats a demon, but not before being cursed by it. The curse enhances many of his fighting abilities, but at the eventual cost of his life if it is not removed. During his journey to find a spirit of the forest to help him, he comes across a wolf clan led by a wolf goddess named Moro and a human girl named San. He finds himself caught in a war between humans and forest spirits who are being consumed by the greed of the humans. It is a beautifully animated movie with well-done animals and fierce wolves throughout, and is perfect for nature lovers and those with an interest in Japanese history and mythology. 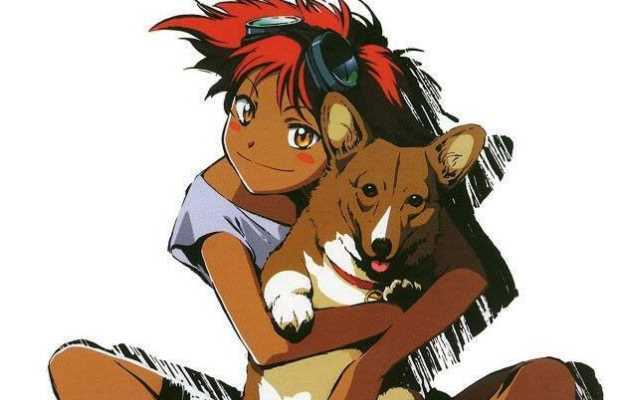 Another classic anime, Cowboy Bebop does not have a dog in a central position as others on the list of the best anime with dogs, but it does feature a dog amongst its main cast of characters, alongside his insane master. Ed is a hacker girl with crazy skills and an even crazier attitude and is the owner of a genetically-enhanced Welsh corgi named Ein. Ed’s dog has the intelligence of a human and can be argued to be even more intelligent than the rest of the human characters in the show, as he often times brings the main group out of a sticky situation with his computer skills and other tricks, though he is very rarely given the credit he deserves for saving them. The anime itself is about a team of bounty hunters aboard a ship called the Bebop and the misadventures they have trying to collect the bounties on criminals throughout space. Cowboy Bebop as a whole is such a popular anime that it is often called a gateway anime, capturing the attention of non-anime watchers and turning them on to the medium. It is a sci-fi anime with bounty hunters, rivalries, action, and comedy, making it perfect for anyone. It is definitely an anime that should be checked out by anyone who calls themselves a fan of the genre. Like Cowboy Bebop, Fullmetal Alchemist: Brotherhood does not have a dog as the main character, nor even among the main cast of characters, but does have multiple supporting dog characters that will make you fall in love with them quickly. Black Hayate, Den, and Alexander are three popular dogs from the Fullmetal Alchemist: Brotherhood anime, and each one has its own quirks and personalities. Black Hayate is owned by Lieutenant Riza Hawkeye, a main character that is as loyal to her commanding officer as her dog is to her. Black Hayate is a well-trained military dog who, despite being a puppy, earns his worth in the anime. Den belongs to the main character’s engineer, a young girl named Winry who specializes in robotic limbs and even made a new leg for Den to help him walk after an accident. He is the perfect pet and a loyal bodyguard to Winry’s family and friends. Finally is a dog called Alexander, who cannot be talked about too much without giving a spoiler. The best way to put it is that Alexander will have you quickly attached to him to the point of shedding tears. You may want a box of tissues when you reach his episode. Naruto closely follows the life of a boy whom everyone believes has the spirit of a demon inside of him. As the boy grows he decides to prove the people in his village wrong by becoming the strongest ninja and showing them he is worthy of their trust. The coolest thing about Akamaru is that when his master, Kiba, activates a particular jutsu, he can actually mimic Kiba's appearance. Then the two can even join together to become a two-headed wolf monster. Akamaru is Kiba Inuzuka's ninja dog, best friend, and constant companion. At the start of the series, Kiba can carry him around on his head or inside his jacket, but by Part II of the Naruto storyline, he is large enough for Kiba to ride on his back. Akamaru has a heightened sense of smell, hearing, and the ability to detect others' chakra levels. He acts as a valuable tool for Kiba in hostile situations. To help Kiba keep track of opponents, Akamaru uses scent marking, that's right, he pees on opponents and tracks them. In the epilogue of the series, a senior Akamaru fathers a litter of puppies that are among the assortment of animals living with Kiba and Tamaki. In this exciting anime series, aliens called Amanto have invaded the Earth, overpowered the government of Japan, and outlawed the carrying of swords by the once proud samurai. They also took people's jobs and are essentially running Japan like a sweatshop; using the natives as laborers. Gintoki Sakata, Shinpachi Shimura, and Kagura are a trio of self-employed misfits who work in an odd jobs shop called Yoruzuya Gin-chan. They basically offer to do anything for the right price, from finding lost kittens to saving the world. They work alongside Sadaharu, a giant white dog. At first glance, Sadaharu doesn't look like much, but once the camera pans out, you realize that he is enormous. Sadaharu isn't just a dog either, he's an inugami, a dog-god. He can grow even larger by eating strawberries and milk, among other interesting talents. Strangely, Sadaharu's favorite pastime is biting the heads of various characters in the series. When listing the best anime with dogs, you have to include Yatterman. In this series a mysterious stone, known as Skull Stone, is scattered across the globe. It holds the power to reveal the location of the largest deposit of gold in the world. A team of three villans are searching for the stone, but standing in their way are Gan-chan and Ai-chan and their large mechanical dog Yatter-Wan. Yatter-Wan is equipped with rescue sirens and lights, iron pellets that he fires out his nose, fire hoses on his back, and a horde of mini-robots that help him fight off the bad guys. The dog-shaped prototype robot was built by Gan-chan, a mechanic and son of a famous toy designer who came up with his original design. Gan-chan and his girlfriend Ai-chan join forces with Yatter-Wan to fight the evil villians, known as the Dorombo Gang, and their lackeys. The gang of do-gooders call themselves the Yatterman. Another of the best anime with dogs, this series follows an assassin, Casshern. The robot society that rules the planet begins to rust and decay after Casshern murders Luna. Death and despair spread through the land, encompassing everything and everyone. The only person who is unaffected by the affliction, which becomes known as “The Ruin,” is Casshern. He is unable to remember if he really triggered this terrible fate that has fallen upon the entire mechanized civilization, so he embarks on a journey to unravel the mystery that connects Luna, himself, and the plague. A few episodes into the series Casshern meets Friender, the shows canine character, living in a community of robots that have decided to peacefully accept their fate; eventual destruction. Friender hasn't begun to show signs of his own destruction quite yet, and he ends up following Casshern in order to prevent him from wreaking anymore havoc. Rounding out my list of the best anime with dogs, is Excel Saga. This goofy, funny anime is enjoyable for the whole family. Not nearly as dark as Casshern Sins, this show follows hyperactive Excel who will do anything and everything to try to please her lord, Ilpalazzo. Ilpalazzo wants to take over the planet. Excel's misadventures take her and her partner, Hyatt, who always seems to be dying, all around the world. They meet several strange people along the way and find themselves in quite a few wacky situations. Everything is goofy and bizarre, as any kind of anime or entertainment genre gets mocked and spoofed frequently. 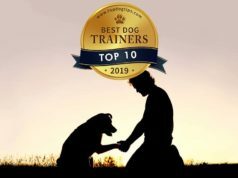 Excel brings her pooch Menchi along on her adventures as well, and although Menchi may not have as many super-powers as some of the other dogs on this list, she is an independent-minded pup and extremely intelligent. Excel refers to Menchi as “emergency rations” in more than one instance, but Menchi manages to escape her clutches a couple of times, adventuring with other dogs and even another person.